Shore Leave 39, that is. Well, maybe not exactly. But if you want to attend, you have to start preparing now. It's in July this year, from the 7th to the 9th to be exact. There is a limit on the number of attendees and hotel rooms for those coming in from out-of-town. I've already received my registration confirmation. And the guest list of actors/actresses is growing. I don't watch many of movies or a lot TV, but I am familiar with a couple of them. For me, that's pretty good. It's what draws most people to this convention. Some people think that only, uh, "eccentric" people attend conventions like these. I beg to differ. I also plan to post to the blog during the convention. I haven't done the best at this in the past, but if I'm lucky, at least one post will be while the convention is still in progress. Shore Leave is a fan-run science fiction convention in Hunt Valley, Maryland featuring guests from your favorite movies and TV shows of yesterday and today. Ready for another of my cheesy free photos? Well, you're getting one anyway. Someday, I'll manage to post a picture here that is worthy, but this will have to do for now (I seems to say that a lot on these free photo posts...). Over the years I've had more than one sky photo on my blog. I like sunsets and the colors they display. This time I caught Venus sparkling in the gloaming as I was getting off the train from work. I've been looking for an excuse to use the word gloaming, and this post is it. One more thing off my list. Anyway, Venus is really bright this month, so even my cell phone could get a decent shot. 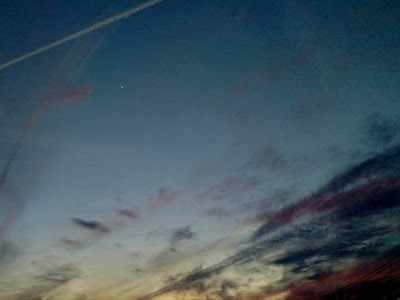 It's often easier to get a picture of the Moon or bright planets with a cheap phone camera during dusk or early morning when the contrast is not as great. That's my tip for the day. Image IMG_20170222_225632_CR.jpg ©2017 K. R. Smith - www.theworldofkrsmith.com - may be used, in whole or in part, with attribution. I spent a little time at the local gem and jewelry show over the weekend. My better half makes (and buys) jewelry, so it's an activity we do at least twice each year. Sometimes, even I purchase an interesting item or stone should it catch my eye. 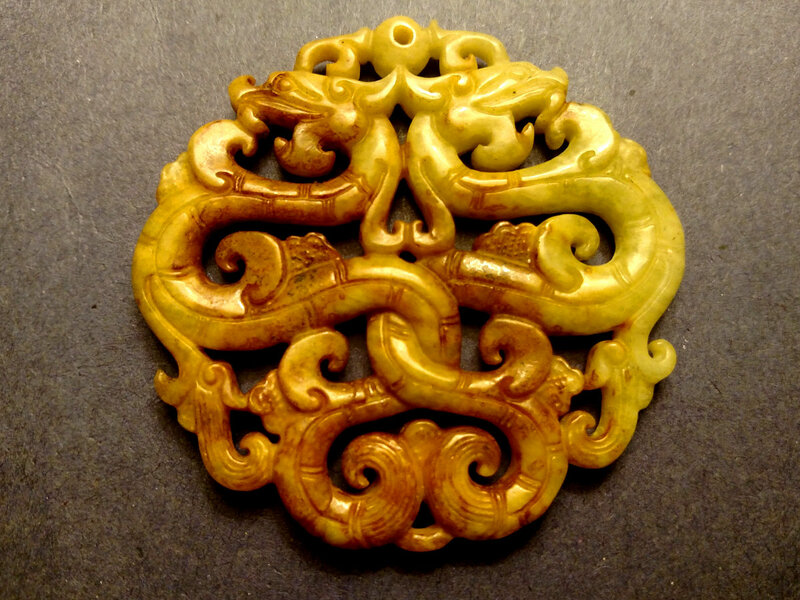 Many of the vendors are Chinese or Indian, so it comes as no surprise there are carvings of cultural items. There are a lot of Buddhas, elephants and all sorts of other animals, and, of course, dragons. I happened to see a number of these inexpensive carved dragons in a display box and couldn't resist. So, what do dragons have to do with writing? Well, not a great deal. I did write one dragon story (The Sword of Hexworthy Manor) for the Swords of Darkness anthology, but it's really not a topic I dwell on. I really liked these little guys, though. Not sure what the stone is—probably a type of jade. Not all jade is the deep green expensive stuff. It doesn't matter so long as I like it. Now I need to find a nice place to hang it. The carving is only about 3 inches (75 mm) in width and reasonably light in weight, so it won't require any special mounting. Once displayed, I'll have this for inspiration should I need to write another dragon story! First of all, Happy Valentine's Day! It's taken a while, but it's finally here! 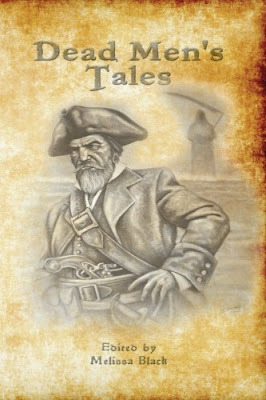 Fringeworks has published Dead Men's Tales, a pirate-themed anthology with the twist that each story is told from the point of view of a deceased character. My contribution to this collection is Skarett's Treasure. This story concerns the plight of an indentured servant (Thomas) who, hoping to gain enough money to escape from the pirate's stronghold with the mesmerizing Maria, gets mixed up with Captain Skarett. 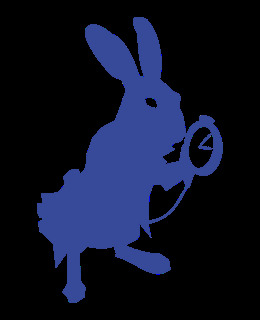 What type of story is Skarett's Treasure? Well, there are pirates, of course, mixed in with a little bit of horror and a touch of humor. While my tale may leave you wanting more, by the time it's done, Thomas will have had his fill! I need to get a copy to see what changes the editor, Melissa Black, may have made to the story. I hope it's as good as I remember! Or, at least, not as bad as I fear... As an added bonus, the foreword was written by Kevin R. McNally, one of the main actors in the Pirates of the Caribbean movie series. The cover is by Darrel Bevan. Dead Men's Tales is available in paperback from Amazon.